A01. A landslide is defined by Cruden (1991) for the Working Party on World Landslide Inventory as a movement of a mass of rock, earth or debris down a slope. Landslides are a type of "mass wasting" which denotes any down slope movement of soil and rock under the direct influence of gravity. The term "landslide" encompasses events such as rock falls, topples, slides, spreads, and flows. The size of individual landslides range from metres squared to kilometres squared (about the size of sixty cricket fields!) The speed they travel at ranges from slow (millimetres per year) to very fast (e.g., as fast as 80 kilometres per hour for debris flows). An active landslide in the Gansu Province of China (Credit: Bruce D Malamud, 2012). A video of this landslide can be found at Vimeo. A good link for ‘what are landslides’ can be found at the UK British Geological Survey. This FAQ updated on 12 Nov 2013 by the EU FP-7 LAMPRE project. A02. Landslides happen when rocks and sediment loosen and roll down a slope. Some of the factors that influence the occurrence of landslides include gravity, water, slope angle, climate, weathering, vegetation, overloading, geology and slope stability. How these factors interrelate is important in understanding what causes landslides along with an understanding of the impact humans have on these factors by altering natural processes. modification of slopes by construction of roads, railways, buildings, etc. vibrations from heavy traffic, blasting, etc. excavation or displacement of rocks. Landslides are influenced by gravity, water and triggering events. When shear stress (driving forces) of the material becomes more than its shear strength (resisting forces) the material moves down-slope. The shear strength divided by the shear stress is called the Factor of Safety. A good resource for driving and resisting forces can be found in a lecture from Humboldt University. A03. 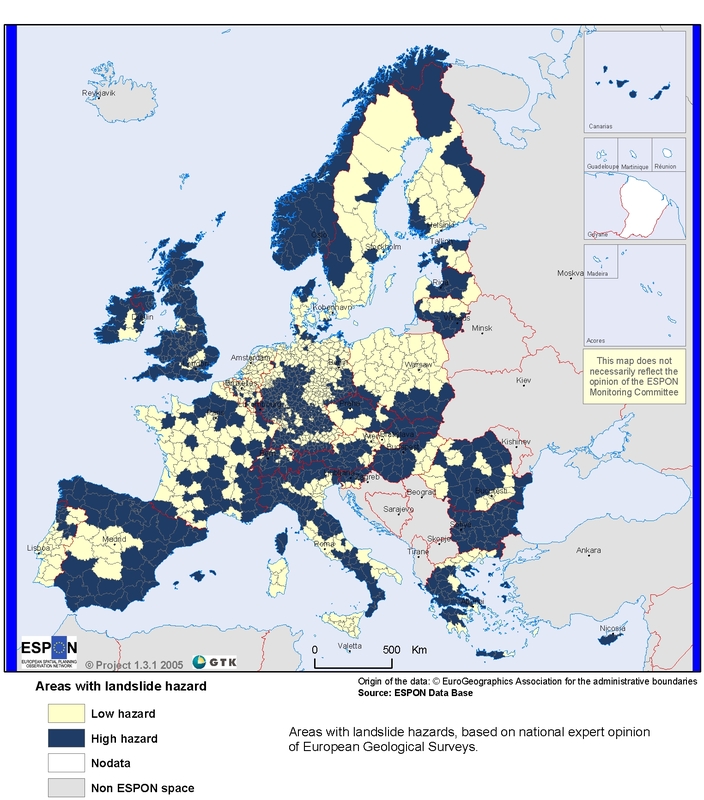 The most common causes of landslides in Europe are intense rainstorms and large earthquakes. Other factors that cause significant landslides in Europe are snow melt and anthropogenic factors such as buildings causing increased weight on a hillslope, roads undercutting the hillslope and poor drainage of water. These factors cause slope failures and sediment flows resulting in landslides. A04. Landslides are usually found in hilly or coastal regions owing to the instability of slopes and cliffs. Landslides may be either subaerial (processes taking place on the Earth’s surface, exposed to the air) or subaqueous (processes taking place in the water, such as where the bottom of a lake or an ocean meets the water). In hilly and mountainous regions, many shallow landslides occur in depressions or small valleys, where slopes converge, because this corresponds to where water tends to be located. This FAQ updated on 26 Aug 2014 by the EU FP-7 LAMPRE project. A05. A triggered landslide event includes both a trigger and the landslides that occur in the hours to days following the trigger. Examples of triggers include earthquakes, heavy rainfall, sudden snowmelt, volcanic eruptions, slope modification, undercutting and fire. Anywhere from a single landslide up to many thousands can be generated as part of a triggered landslide event. A06. There are many classifications for landslides. Varnes (1978) came up with a classification for landslides based on type of movement and material. An abbreviated version from the British Geological Survey (BGS) (2013), is given below. Fall: Falls are landslides that involve the collapse of material from a cliff or steep slope. Falls usually involve a mixture of free fall through the air, bouncing or rolling. A fall type landslide results in the collection of rock or debris near the base of a slope. Topple: Topple failures involve the forward rotation and movement of a mass of rock, earth or debris out of a slope. This failure is noted to occur around an axis or point at or near the base of the block. A topple often results in the formation of debris or a debris cone at the base of the slope. Slide — rotational, translational: A slide type landslide is a down-slope movement of material that occurs along a distinctive surface. If the surface is straight then it is termed translational or planar. If this surface is curved the slide is called a rotational. Spread: Spread landslides involve lateral spread of rocks and soil masses. Flow: Flows are landslides that involve the movement of material down a slope in the form of a fluid. Flows often leave behind a distinctive upside-down funnel shaped deposit where the landslide material has stopped moving. Complex: These landslides are a combination of falls, topples, slides, spreads and flows. Restrict construction near steep slopes, close to mountain edges, near drainage ways, or natural erosion valleys. Get an assessment of your property. Contact local officials, regional geological surveys or departments of natural resources, and university departments of geology. Landslides occur where they have before, and in identifiable hazard locations. Ask for information on landslides in your area, specific information on areas vulnerable to landslides, and request a professional referral for a very detailed site analysis of your property, and corrective measures you can take, if necessary. If you are at risk from a landslide talk to your insurance agent. Debris flow may be covered by flood insurance policies, but this varies from country to country. Have flexible pipe fittings installed to avoid gas or water leaks, as flexible fittings are more resistant to breakage (only professionals should install gas fittings). In mudflow areas, build channels or deflection walls to direct the flow around buildings. Remember: If you build walls to divert debris flow and the flow lands on a neighbour’s property, you may be liable for damages. This FAQ updated on 11 Jan 2015 by the EU FP-7 LAMPRE project. Collapsed pavement, mud, fallen rocks, and other indications of possible debris flows or landslides can be seen when driving (embankments along roadsides are particularly susceptible to landslides. Storm-water drainage on slopes changing their patterns (especially where runoff water converges). If you remain or are caught suddenly at home, move to a second story if possible. Staying out of the path of a landslide or debris flow saves lives. If you are near a stream or channel, be alert for any sudden increase or decrease in water flow and for a change from clear to muddy water. Such changes may indicate landslide activity upstream, so be prepared to move quickly. Don't delay! Save yourself, not your belongings. Be especially alert if you are driving. Embankments along roadsides are particularly susceptible to landslides. Watch the road for collapsed pavement, mud, fallen rocks, and other indications of possible debris flows. A landslide can completely engulf a car on a road that is in its path. Whenever you are in the path of a landslide or debris flow, move away as quickly as possible. If escape is not possible, curl into a tight ball and protect your head with your hands or a helmet. A10. (The text below is from Federal Emergency Management 2013 and Be Safe During a Landslide 2013)The danger is not over after a landslide has passed through. It may not be the only landslide, and there will be a lot of damage left in the wake of the landslide that can present hazards. There are a number of things that you should do to minimize the danger. Watch for associated dangers such as broken electrical, water, gas, and sewage lines and damaged roadways and railways. Understanding that returning home can be both physically and mentally challenging. Above all, use caution. Keep a battery-powered radio with you so you can listen for emergency up­dates and news reports. Use a battery-powered ﬂash light to inspect a damaged home. The ﬂashlight should be turned on outside before entering—the battery may produce a spark that could ignite leaking gas, if present. Watch out for animals, especially venomous snakes. Use a stick to poke through debris. Use the phone only to report life-threatening emergencies. Stay off the streets. If you must go out, watch for fallen objects, downed elec­tric wires, and weakened walls, bridges, roads, and sidewalks. A11. There are different organizations which would like to know if a landslide has occurred in your area. The first organization you should contact, if life or property is in danger, is emergency services. Other than that there are many organization which are involved in landslide research and would benefit from your reporting. One such global landslide reporting platform is Worldwide Landslide Report. Different countries have different ways of reporting landslides. For example, in the United Kingdom, one can report landslides to the British Geological Society landslide reporting page. A12. The likelihood of landslides, including debris flows, begins to decline after a day or more of dry weather. Some deep-seated landslides may occur days, even weeks to months, after long periods of intense rainfall. However the areas near mountain slopes, canyons and landslide prone areas are more vulnerable and residents of those areas should stay alert even after days following heavy rains. adversely affecting a variety of environmental and human systems and resources including water supplies, sewage disposal systems, and roadways. Resources like fisheries, forests, dams, and mines can be affected for years after a slide event. A. Addressing the slope (gradient): One of the main causes of landslides is gravity, so that the steeper the slope, the greater the likelihood of a landslide occurring. One landslide prevention technique is to regrade the slope, which means reducing the steepness (i.e. the angle) of the slope. B. Addressing the amount of water: Another main cause of landslides is water, which can cause the earth to be much heavier and change the grain to grain contact. This results in more likelihood of a landslide occurring. Heavy rains, flash floods, melting of snow in warm weather, changes in the groundwater table, and poor drainage, can all result in increasing the likelihood of landslides. Geotechnical engineering practices, that can reduce the likelihood of landslides occurring include: diverting water and draining water from slopes. C. Addressing added weight at the top of a hill or slope: Human-made structures (houses, buildings, mine waste areas, water reservoirs) on top of hills or slopes can also result in landslides, as they add weight. One technique in this case is to calculate an adequate setback distance between the top of slope and construction. D. Addressing undercutting of the toe of the slope: Another human-made cause of landslides is undercutting the toe of a slope. This can happen when a road is cut into the side of a hill, or water from a river or large body of water undercuts a slope. The toe plays a critical role in keeping the upper portion stable. Landslide prevention in this case entails either filling in the toe with material, regrading the slope (see A above), stabilizing the slope (see E below), or the construction of soil mounds with sloping sides, placed at the toe of the slope to provide additional resistance to the potential movement of the upper part of the slope. One can also use vegetation to stabilize a slope. F. Sustainable land use: Certain types of land use increase slope instability, for example roads or trails and forest conversion to agriculture (typically associated with burning). Restricting those land use types and engaging in sustainable land use practises can reduce landslide. These include tree planting, soil and water conservation activities. Finally, we should recognize that we cannot protect ‘everyone’ in ‘every location’, and there are other approaches to managing landslide risk, such as ensuring appropriate land-use regulations are in place. For example, people might be refused zoning permission to have a house where landslides are known to frequently occur. Predictions (in the landslide community) often depend on knowledge of where past landslides have occurred. This knowledge can come from photos taken by airplanes (air photos), images taken by satellites (remote sensing), asking local people where landslides have occurred in the past (local knowledge) and locally kept reports (town records, newspapers). Knowledge of past landslide events can be combined with information on topography and geology, to give a broad idea of which slopes are more or less likely to fail. Although scientists have an idea that one slope might be more prone to failure than another one, nobody knows which slope will actually have a landslide. Exact predictions are difficult, hence estimation of the chance of one slope being more likely to fail than another is more common. There are warning signs for individual landslides. A good list of these is given by the United States Geological Survey. Not all rainfall or earthquakes trigger landslides, but a greater volume of rain over a longer period will generally trigger more landslides (sometimes many more) than a smaller volume of rain over the same time period. Very large triggered landslide events, where the number of landslides can be tens to hundreds of thousands, can result in large amounts of damage, community isolation, and fatalities. Therefore, some early warning about a large rainfall storm, would give some idea that there may be a large number of landslides occurring soon afterwards. This is part of a national landslide warning system currently being used in Italy. Predicting where a given landslide will occur, when AND how big is currently beyond our capabilities. But, we can have general ideas of where is more likely and where is less likely for landslides to occur. See also Q20 on landslide susceptibility. With this knowledge, we can prepare ourselves the possibility of landslides. A16. A hazard does not become a disaster until humans, animals, or infrastructure are affected. Major parts of Europe have been subject to landslides (and earthquakes, flooding, heavy wind, drought, etc.) over time, and these landslides in turn can result secondary effects such as damming of rivers (flooding). The number and intensity of landslide events will continue to fluctuate over time. But, more than a particular change in the number or type of landslide events, we think the main risk in the future will be increasing populations in the region over time, resulting in a greater chance of the same size landslide event affecting people, as larger and larger disasters, because of the increased exposure of people. A17. Education and communications! With the best planning and engineering efforts in the world, one cannot stop people living in dangerous areas if they do not understand the risk. Education can take many forms, including educating the general public, elementary school, middle school, secondary school, university, and politicians. No concepts are ‘too complex’ to explain to any group of people. Knowledge allows the public and decision makers to make informed choices, improve land management and better understand the risks they and others potentially face around them. A18. Yes, landslides can trigger tsunamis. A tsunami occurs when there is a sudden, non meteorologically-induced impulse to the water in the ocean or lake, with the impulse wave often travels at great speed and with sufficient force to inundate the land. When there is a landslide that results in a large amount of material displacement into the water in a short amount of time, the displaced water radiates out as waves in all directions. A good example of this can be seen in the ripples that fan out when a stone is thrown into a pond. These waves can become tsunamis.Some examples of landslides triggered tsunamis are Aitape tsunami in Papua New Guinea on 17 July 1998 and Vajont Dam tsunami in Venice, Italy in 1962. Alaska's dire Lituya Bay and Lake Tahoe, between California and Nevada are other areas prone to landslide tsunamis. A19. No, snow avalanches are not landslides. A snow avalanche is a rapid flow of snow down a slope. They are typically triggered from a mechanical failure when the forces on the snow exceed its strength. In snow avalanches, a layer of snow can either slide over another layer of snow or an entire snow cover can slide over the ground. Although primarily composed of flowing snow and air, large avalanches have the capability to entrain ice, rocks, trees, and other material on the slope. On the other hand landslides are the movement of material (mass-wasting) down a slope, such as soil, rocks and debris. A20. Land susceptibility maps ranks slope stability of an area into categories that range from stable to unstable. Susceptibility maps show where landslides may form. Many susceptibility maps use a colour scheme that relates warm colours (red, orange, and yellow) to unstable and marginally unstable areas and cool colours (blue and green) to stable areas. A Europe wide landslide susceptibility map (the likelihood of landslides occurring) is given by Günther et al. (2013). A21. A landslide inventory map can show the locations and outlines of past landslides. The inventories might include those landslides resulting from a single triggered event (e.g., an earthquake causing a large number of landslides), or a historical inventory map, which shows all the past landslides that we currently see in the landscape around us. Small-scale maps may show only landslide locations, whereas large-scale maps may distinguish landslide sources from deposits and classify different kinds of landslides and show other pertinent data. It is very important to prepare landslide inventory maps and to know where the landslides occurred in the past. This information can be used in preparing landslide susceptibility maps and in predicting landslides, which in turn can be used to reduce the damage caused by landslides. The impact might be monetary loss, loss of life, etc. A landslide economic risk map shows the potential annual cost of landslide damage throughout a region. Risk maps combine the probability information from a landslide hazard map with an analysis of all possible consequences (property damage, casualties, and loss of service). A23. A landslide hazard map indicates the possibility (probability) of landslides occurring in different parts of a region. A landslide hazard map may be as simple as a map that uses the locations of old landslides to indicate potential instability in the future, or as complex as a quantitative map incorporating probabilities based on variables such as rainfall thresholds, slope angle, soil type, levels of earthquake shaking and road infrastructure which may have weakened the surrounding area in which roads have been built. An ideal landslide hazard map shows not only the chances that a landslide may form at a particular place, but also the chance that it may travel downslope a given distance. Start with some of the links given in Q24 above. Brunsden, D. (1985). Landslide types, mechanisms, recognition, identification. Proc. Symposium on Landslides in the South Wales Coalfield, 1-3 April 1985. The Poly. of Wales, 19-28. Cruden, D.M. 1991, "A simple definition of a landslide", Bulletin of the International Association of Engineering Geology - Bulletin de l'Association Internationale de GÃ©ologie de l'IngÃ©nieur, vol. 43, no. 1, pp. 27-29. Cruden, D.M. and Varnes, D.J. (1996). Landslide types and processes. Landslides: investigation and mitigation, 247, pp. 36-75. Dikau, R., Brunsden, D., Shrott, L., Ibsen, M. L. eds (1996). Landslide Recognition. Identification, Movement and Causes. Wiley, Chichester, UK, 251 pp. Günther, A., Reichenbach, P., Malet, J., Eeckhaut, M., HervÃ¡s, J., Dashwood, C. & Guzzetti, F. 2013, "Tier-based approaches for landslide susceptibility assessment in Europe", Landslides, vol. 10, no. 5, pp. 529-546. Guzzetti, F., Carrara, A., Cardinali, M. and Reichenbach, P. (1999). Landslide hazard evaluation: a review of current techniques and their application in a multi-scale study, Central Italy. Geomorphology, 31(1), pp. 181-216. Hutchinson, J.N., 1988. Morphological and geotechnical parameters of landslides in relation to geology and hydrology, General Report. In: Bonnard, C., (Ed), Landslides, Proc. 5th International Symposium on Landslides, Rotterdam: Balkema. Vol. 1, 3-35. IUGS—Working group on landslide (1995). A suggested method for describing the rate of movement of a landslide. Bulletin of the International Association of Engineering Geology 52, 75–78.